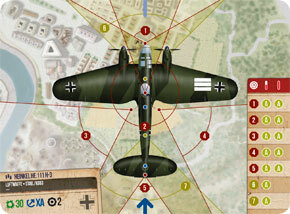 The first preview article about the Heinkel He.111 focused on the history of this aircraft. 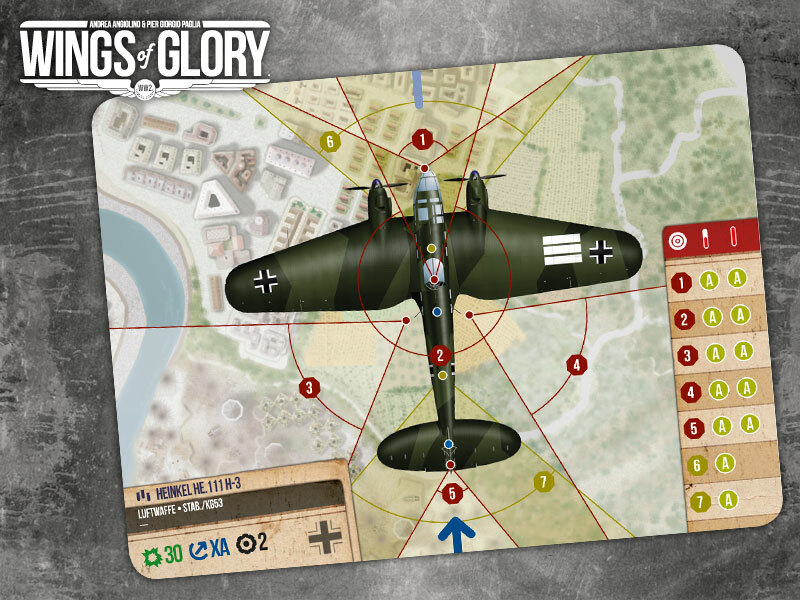 Now it’s time to know something more about the two models featured in the WW2 Wings of Glory Special Packs and how they are represented in the game. 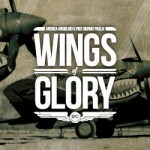 Both Heinkel He.111s, entering in the Wings of Glory universe, are H variants used by the KG 53 (Kampfgeschwader 53) "Legion Condor", which were employed on all the fronts in the European Theatre in the World War II. One of them is an H-3, a variant rolled out from the production line on November 1939, used by the Stab./KG 53. The other is an H-5, produced starting from August 1940, and widely employed in that year’s winter campaign against British cities. 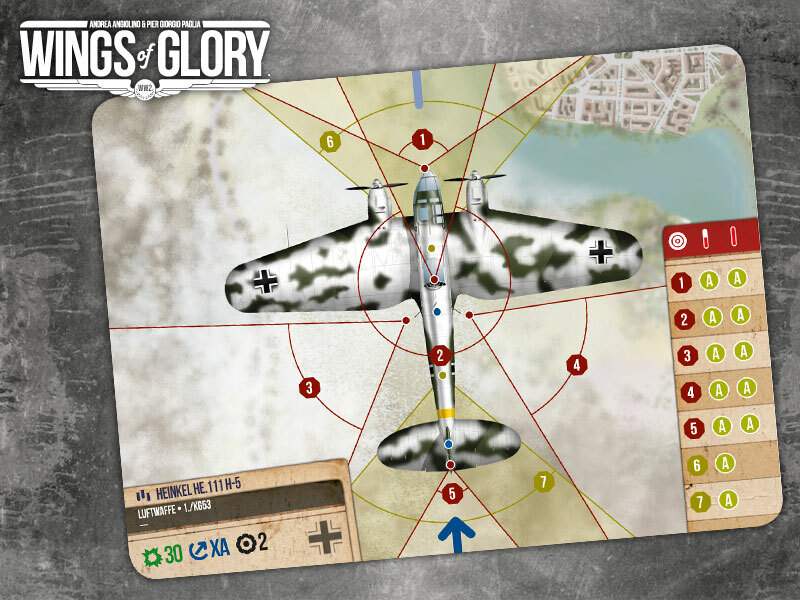 The model presented in Wings of Glory served the 1./KG 53 group and has a snow camouflage skin. 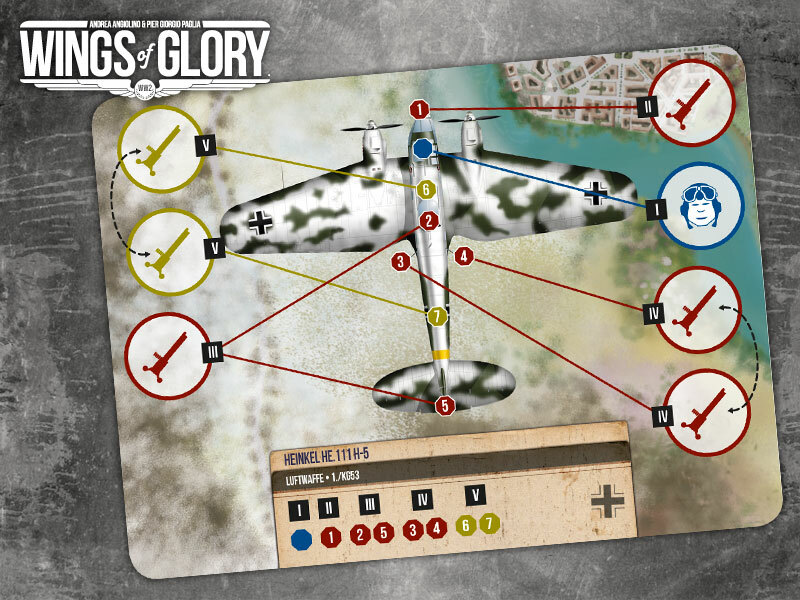 The Special Packs with the bombers introduce in Wings of Glory game multi-engine aircrafts with more machine guns and larger crews. 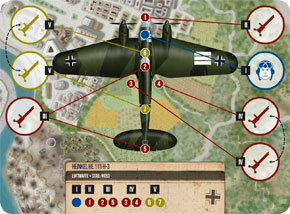 For the Heinkel He.111, the game stats indicate its powerful armament (5 fire arcs using the basic rules, 7 with the advanced rules), the high damage resistance (30 points) and the numerous crew members (5 in basic rules, 6 in advanced). The bombers’ airplane cards and bases have no longer a single “center” of the airplane. 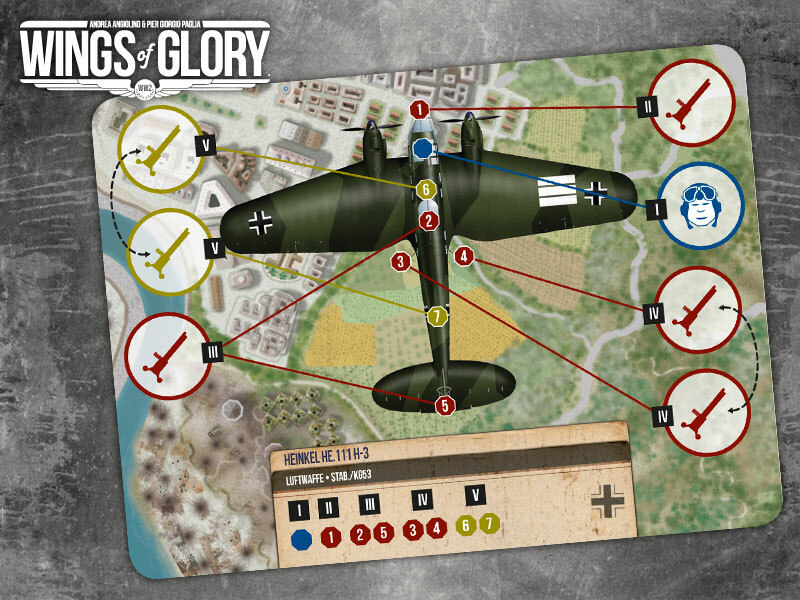 The airplane stand (or the blue dot at the center of the airplane on the airplane card) is used to decide whether the airplane is inside or outside the gaming surface and for any other use apart from firing. Multiple colored dots indicate the position of the machine guns for the purpose of firing. All multi-engine airplanes have several machine guns. Colored (red with basic and standard rules, or dark yellow with advanced rules) dots are used to mark machine gun positions: there is one dot for each firing arc. The firepower of each machine gun is indicated on the airplane card, beside the appropriate number. There are firing arcs that overlap other firing arcs, so a target airplane can be fired at by more than one of an airplane’s machine guns at the same time, if it is within more than one arc. 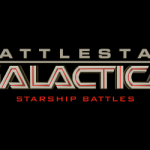 Airplanes with several firing arcs can fire at one target for each arc in each turn. If the same gunner handles multiple machine guns, he can fire only one of these guns in the same turn. 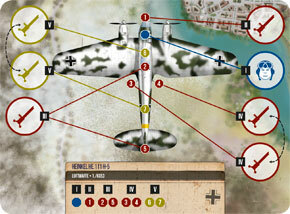 The airplane management card is used only to show if a crewman has multiple roles, when playing with basic rules. It shows several role circles, each indicating the role that a crewman has on the airplane (I – Pilot, II – Front Gunner, III – Dorsal Rear and Rear Gunner, IV – Left and Right Gunner, V – Front and Rear Ventral Gunner). 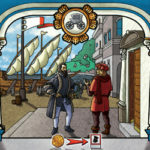 Each circle includes a roman numeral, which refers to the specific crewman that handles the role – some of them have multiple roles, and in this case their numeral appears inside different role circles, connected by a black line. 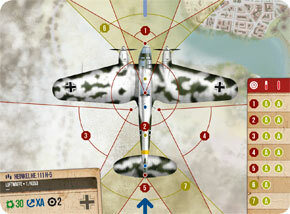 The role of pilot is indicated by the blue pilot symbol in a blue circle, while the gunner’s one is designated by the machine gun symbol in a colored circle. Each role circle for a gunner is connected to the number of that machine gun on the airplane, matching the number used on the airplane card. There are also Special Rules for the Heinkel He.111 bombers related to their machine guns – lateral, dorsal and rear, and ventral ones. The two lateral machine guns, one to the left and the other to the right, are manned by the same gunner (crewman IV). 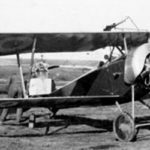 With the Advanced Rules, against targets at a higher altitude, these weapons ignore the normal forward limits of the firing arc and can fire over the wings. A different gunner (crewman III) operates the dorsal rear machine gun and the rear machine gun. 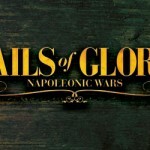 As an exception to the general rule that each gunner can only fire one of his weapons each turn, he can fire both machine guns in the same turn. The dorsal machine gun cannot fire against targets at a lower altitude. The Heinkel He.111 H also has two ventral machine guns, positioned close to the center of the plane, one that fires forward and one backward, also in this case manned by the same gunner (crewman V). 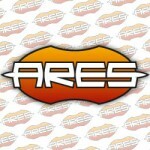 These machine guns are used only with Advanced Rules, and can fire only against targets at a lower altitude.